No waterproofing system I know of is designed to work without proper drainage. Without relief, water can build up tremendous pressure underground. A waterproofing manufacturer won't warrant its product if drainage is missing or inadequate, or if the structure is built on a site where proper drainage is impossible. The minimum drainage for any building is a perimeter footing drain. Depending on conditions, some buildings will require an underdrain system or a sump pit with a pump. 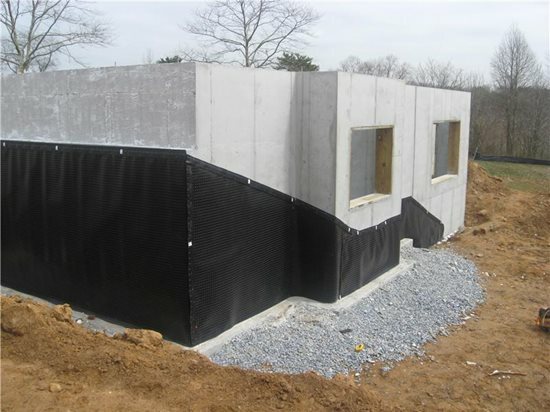 The ground at the top of the foundation wall offers the first line of defense against a wet interior space below. The more water that can be removed from the equation at the earliest opportunity, the better the total waterproofing or dampproofing system will function. This area is sometimes neglected but is crucial to success in both dampproofing and waterproofing. This downspout discharges too close to the foundation. Keep the water that comes off the roof from ending up in the basement by using a thorough gutter system. 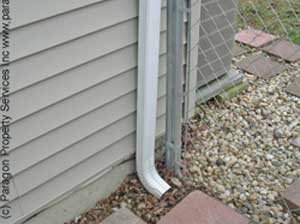 Collect the water in gutters and send it well away (10 feet at least) from the foundation wall in downspouts. Don't undersize either component-the smallest sizes clog easier and overflow quicker. Compact backfill in lifts next to foundation walls, otherwise it will settle over time and form a reverse slope, putting water where it's unwanted. However, be careful not to crush the drain pipe in the initial lift. Final grading should form positive drainage away from the house. The IRC requires a ½ inch per foot slope for at least 6 feet. Maintain this everywhere, through foundation steps and around corners. Some designs call for the use of downspouts discharging into 6-mil plastic pipes 6 inches below grade with the same positive slope to prevent excess surface water from percolating down. This is especially true in cold climates where heavy ice and snow on the roof preclude the use of gutter systems. Even properly graded and compacted surfaces can change over time, so the ground around the house may occasionally need to be re-dressed to account for settlement of the backfill. Trees, according to the Department of Housing and Urban Development, should be no closer to a foundation than their eventual height, otherwise tree roots can clog drains and can dry out soils enough to cause settlement. In areas where expansive soils are present, it is doubly important for structural reasons to prevent water from infiltrating under footings or slabs. While there may be resistance to spending time and money on something a homeowner may never even see or think about again, it's best to do it correctly from the start. It's been said before, but it's never been more true than in this area of residential construction-it's much easier and cheaper to do it right the first time than to dig it up and fix it later. Flexible drain pipe laid into a trench with plastic below and surrounded by gravel. Patterson Construction, Inc.
EPS aggregate and enclosed in polystyrene netting. 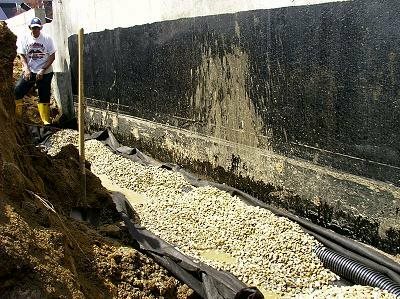 Strip drains, like this Form-A-Drain, double as stay-in-place formwork for the footing.CertainTeed Corp.
Drainage is a key element of any waterproofing or dampproofing system. 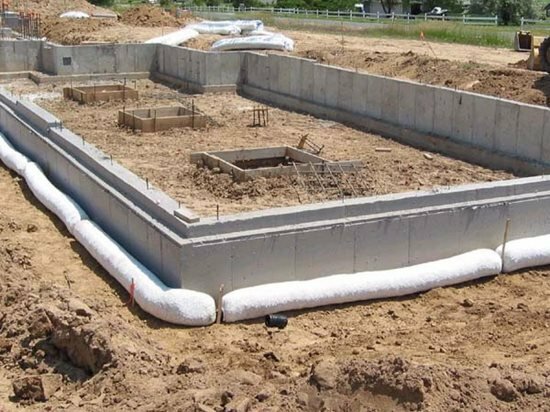 Surface drainage is the first opportunity to mitigate water infiltration, but it is very difficult to keep all water away from foundation walls-both surface water and ground water can lead to problems. 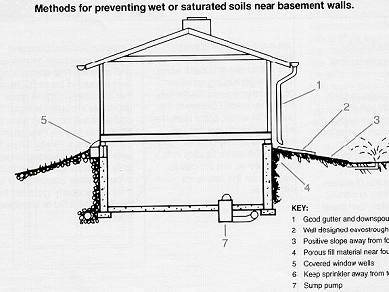 So it is very important not to use partial measures in draining water that ends up at the base of the foundation wall. Drainage sheets come with an integral termination strip. Cosella Dorken Products. 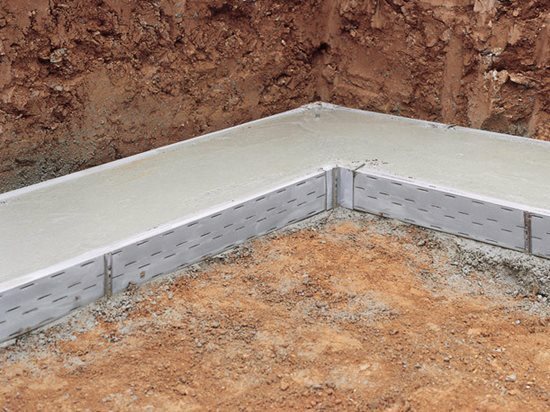 Drainage boards cover the foundation from the ground level to the top of the footing. Cosella Dorken Products. Another approach to waterproofing with applied sheet materials is to use drainage boards, with or without waterproofing on the concrete wall. These dimpled plastic sheets are available from several manufacturers and come in various length rolls, ranging from 4 feet to 9 feet 9 inches tall. The dimpled side is placed toward the foundation and holds the sheet about ½ inch from the wall. A termination strip is attached to the wall at the top. 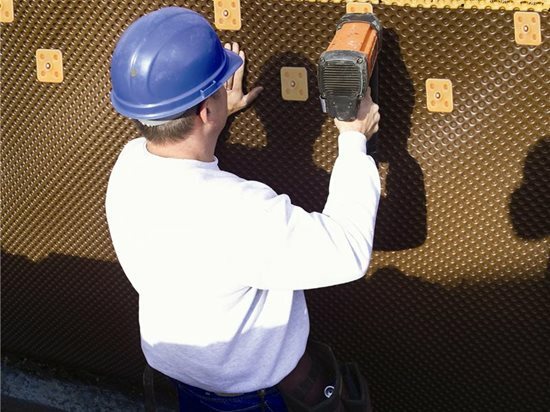 The plastic serves as a waterproofing membrane, keeping water from penetrating to the surface of the wall, and as protection for the membrane on the wall during backfilling. Any water that may get through (by condensation or leakage) can trickle down to the foundation drains through the space formed by the dimples. Different versions of this type of product have filter fabric attached to the dimpled side which is then installed away from the wall and forms the route for water to flow down to the drain. This gap can also serve to dry moisture that remains in the concrete wall from construction. Some drainage boards incorporate solid materials that are porous enough to allow water to flow down while supplying some insulating value to the wall. Still others uses twisted or deformed wire covered with a filter fabric to provide the drainage space. There are lots of options for this component of the overall system. 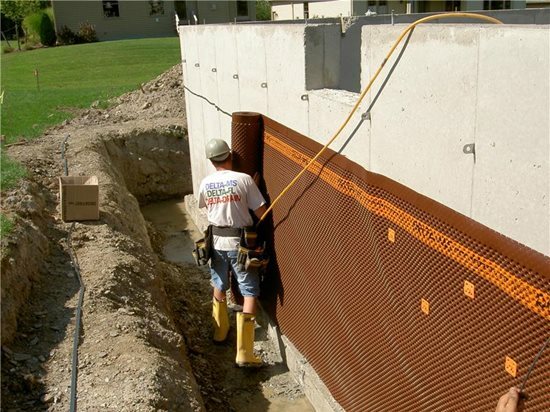 The dimpled drainage board can help reduce intermittent hydrostatic pressure because it moves water away before pressure can build against the foundation. A dampproofing coating is advisable behind drainage boards to prevent incidental moisture infiltration as long as it doesn't interfere with performance or the manufacturer's specifications. Some drainage panels, as part of overall systems, use specially designed drainage boards in combination with waterproofing membranes, to replace drain tile pipes (such as the Tremco system).